Banning street barbecues is Beijing’s latest effort at improving air quality. Photo by Kaj17. Given China’s population growth, and rapid urbanization, Beijing is on its way to becoming a super city – a city with a population greater than 20 million people. A huge footprint and growing urban population have caused ongoing problems with pollution and air quality which threaten city residents’ health. Beijing’s struggle with poor air quality is nothing new. In the days leading up to the Beijing Summer Olympics in 2008, the city’s frantic effort to improve the air quality made international news. Photos of the city’s shockingly polluted air made headlines again in February this past year. In the past decade, Beijing has scrambled to improve the pollution problem by regulating which days citizens can drive cars, levying higher taxes on small cars, and banning vehicles classified as heavy polluters from within city limits. Concentrating efforts on improving transport emissions is wise. A city which was once a bicycling capital has been given over to cars and enormous ring roads, which circle the ever-expanding, often smoggy city. Beijing’s newest measure takes a different approach. 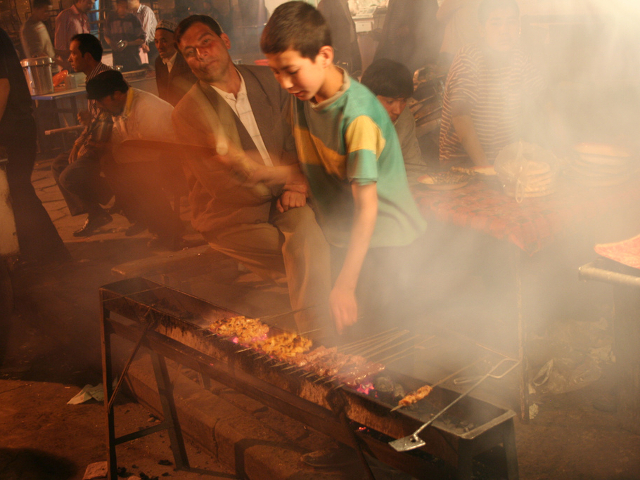 In efforts to reign in the most recent bouts of smog, the government has banned the popular but polluting street barbeques. These outdoor barbecues, known in China as “Chuan’r” are hugely popular in Beijing, among tourists and residents alike. The barbecues, which often set up informally on sidewalks, serve hot meats, and attract large evening crowds who relax and enjoy food and drink at outdoor tables. Though these set-ups have been banned from public outdoor spaces since 2000, Beijing’s Municipal People’s Congress declared a ban on barbecues in any outdoor space last week. Those running outdoor barbecues without government approval will now be substantially fined. According to Global Times, which reported on the street barbecue ban, about 13% of Beijing’s PM 2.5 (the kind of air pollutants that harm people’s health) comes from cooking emissions. Earlier this year, research by the International Council on Clean Transportation (ICCT) revealed that transport emissions accounted for a whopping 34%. The barbecue ban is the latest in Beijing’s efforts to tackle emissions from a variety of sources. These regulations will make a difference, but ultimately these low hanging fruits will not be enough. No matter how many cars are regulated, or barbecues are banned, the city’s layout and inadequate public transport system continue to encourage a reliance on cars, marginalizing those who don’t drive. Because the right-of-way is often given to vehicles, biking and walking in the city, which covers more square miles than the U.S. state of Connecticut, is often impractical and dangerous. The city’s system of cabs and metros can help, but many residents either live too far away from public transit to take advantage of it, or find that the transit system is inefficient and overcrowded. Though most of the population still moves through the city without a personal motorized vehicle, the deadly combination of “super blocks” and wide boulevards combined with the still-very-low cost of car usage continues to fuel car trips and cause air pollution. Tougher financial incentives and long-term planning measures are most likely to be the panacea. Fortunately, the city has realized that they need more than simple regulations. Its recent plan to levy pollution taxes shows a laudable determination to hold auto drivers accountable for the environmental damage they inflict on society. However, on top of financial measures, what Beijing needs most is a real paradigm shift that transcends the current piecemeal measures to more integrated approaches. Beijing must examine its underlying infrastructure and urban design to solve its ongoing problems with pollution. Improving public transit, managing travel demand, establishing fuel efficiency requirements, and returning the city to bicycles are all pieces in the big-picture puzzle.